Brite Inc. has been designing and installing Blackout Curtains since 1977. Our customer service representatives are here to guide you through the layout process, along with answering any installation questions that may come up. We can provide everything you need complete with track, carriers, hardware, curtains, valances for a Light-tight installation. 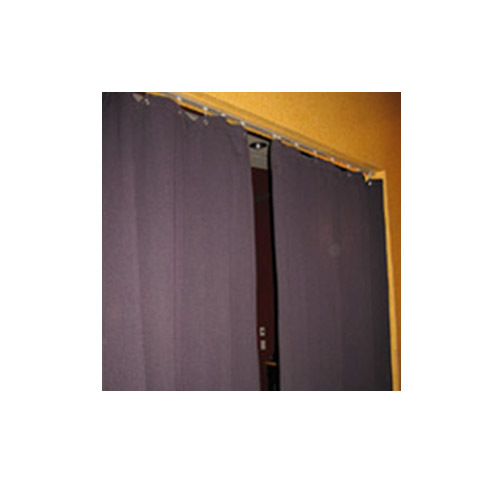 Blackout curtains come standard with nickel plated grommets set 6� on center. Valances and side pockets (where needed) come with Velcro sewn into one long side. Opposite side Velcro comes with adhesive back for a sealed installation. Curtains are available with one way draws or overlapping centers. We can work with you to design the best arrangement for your application. Our fabrics are inherently flame retardant and are light blocking for optimum performance. You can be confident when ordering with Brite Inc. that you have a knowledgeable team that understands the products and installation needs and can work with you to achieve the best possible solution to your application. If you need any assistance or your curtain setup requires options that are not provided in the form below please call 1-800-791-2946 to speak with a representative.